If you need a new television or a new car there are so many to choose from it is difficult to decide which is best for you. Fortunately if you need a new swimming pool roller there are not many to choose from so the decision is made a lot easier. Is it a roller or a reel? First off all are we using the correct language in calling it a swimming pool roller? Not really. Strictly speaking a roller is used to roll something flat like a rolling pin for cooking or a garden roller for your lawn. We should really call it a reel because it is used to reel in your cover. But everyone calls it a roller so we will stick with that word. 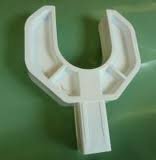 The component parts of a pool roller. 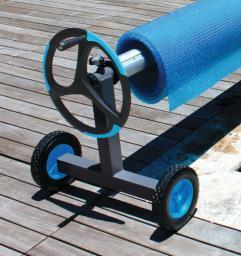 A pool roller is made up from a long hollow tube that the cover rolls on to. The ends of the hollow tube have and end cap in them to seal them, this is know as the End Boss. The tube is held up by two end stands. The top of end stands look like the letter “Y” and that bit is called the Yoke. 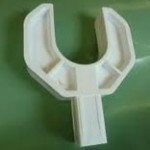 The End Boss on the tube fits into the Yoke of the end stand and it rotates in the Yoke. In to the at least one of the End Bosses goes the Steering Wheel, you turn the Steering Wheel to roll up the cover on to the tube. The tube is actually two or three lengths of tube. They overlap each other like a telescope and slide out to the correct width where they are then clamped to each other to fix the width. Between the tube and the cover are a set of webbing straps joining the cover to the tube. When you first turn the wheel the straps pull the cover off the pool and on to the tube. The straps are fixed to the roller by various means as we will see and the straps fix to the cover usually by the use of male/female plastic poppers and a buckle. The end stand can sit permanently on the side of the pool or it can be on wheels or wheeled castors so you can move the whole roller around. You can un-buckle the straps from the cover and leave the cover on the pool and remove the roller if you wish. Comparing the Monte Carlo, the Slide Lock and the Alux Reel. The three main pool rollers on sale in the UK are the known as the Monte Carlo, the Slide Lock and the Economy Reel. The Alux reel is imported in to the UK from China. It has wheels (not castors) on the bottom of one end stand a “T” bar at the other end. 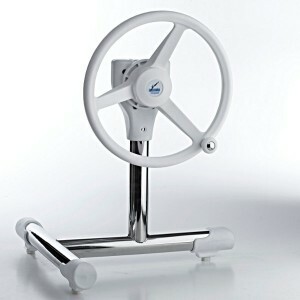 It has one Steering Wheel and is suitable for pools up to 15ft wide. It has two smooth tubes and the straps fix with a self tapping screw. 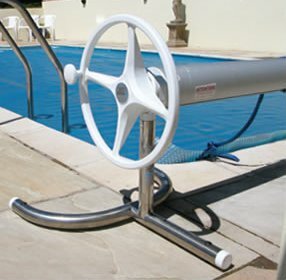 Made from a square aluminium frame, it has very robust construction and it is a very good roller especially for small pools. The Slide Lock Roller is made in the UK. A very popular roller seen on very many pools. It comes with a choice of many types of end stands for floor or wall mounting but the most popular is the free standing version that can have castors fitted. They are made from 1.5 inch stainless steel with a plain plastic yoke. The tubes are aluminium with two larger ones sliding into a central smaller one. 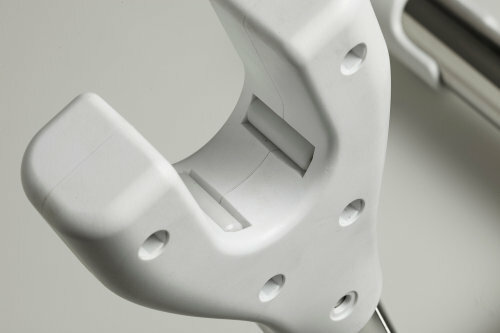 It has groove within it and in the groove is a plastic fitting to take the cover strap. It slides and clamps where you want it. The tubes fix to each other with a small screw. The Monte Carlo Roller is also made in the UK. Fairly new to the market it has taken over from the Slide Lock as the highest quality roller and is gaining in popularity. 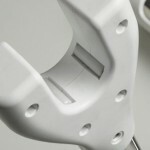 The end stands are made from 1.75mm stainless steel. A quarter of an inch might not sound like much but it makes them much more robust than the other two. The yoke is very sturdy and has a roller bearing within it to make rolling smoother. The aluminium tubes are a set of three like the slide lock but they fix together with a clever clamping system inside a groove which is better than the Slide Lock’s system but in the same groove goes the fixing for the cover strap. If you want to move the position of a cover strap you may have to take out a tube clamp, slide the strap fixing past, and then put the tube fixing back on. More fiddly than the slide lock but a more robust system. For small pools and small budgets choose the Alux Reel. At the top end of the market it is a fight between the Slide Lock and the Monte Carlo. The Monte Carlo is a bit more fiddly to set up but wins out in the end because of its more robust manufacture and its clever design features. Help, advice and product reviews for swimming pool owners written by our own swimming pool experts. PoolStore was the first company in Europe to sell swimming products online. For over 19 years we have been the UK's favourite internet pool supplies store. We have an extensive Help and Advice for pool owners on our main website.